chapter 1: Augustino Steuco, described as a Vatican librarian, was a canon of the Canons Regular of the Lateran. He was appointed bishop of Kisamos (Crete) and director of the Vatican Library in 1538.
page 49: Guénon did make one reference to early contacts with Hindus. He states in Le Théosophisme that "the idea of this book had been suggested to us long before by some Hindus, who even provided a part of our documentation" (Theosophy: History of a Pseudo-Religion, trans. Alvin Moore et al., Hillsdale, NY: Sophia Perennis, 2001, p. 293, n. 5). Instead of arguing that Guénon's understanding of Hinduism derived purely from his reading, one might perhaps argue that it derived principally from his reading. chapter 3: Marianna Torgovnick, in her excellent book Primitive Passions: Men, Women, and the Quest for Ecstasy (Chicago: University of Chicago Press, 1998), explains the Western search for religious experience in the "primitive" in terms of the quest for the "oceanic." This argument is relevant to many Western Sufis, and perhaps to Traditionalism as a whole. chapter 5: Another approving reader of Guénon was the German jurist and political philosopher Carl Schmitt (1888-1985). Arthur Versluis points out that Schmitt referred to Guénon's Crise du Monde Moderne (1927) in his Der Leviathan in der Staatslehre des Thomas Hobbes (1938; The Leviathan in the State Theory of Thomas Hobbes). Schmitt remains a controversial figure, condemned by many for his activities in the Nazi Party (especially in 1933-37), but respected by others for his political thought. 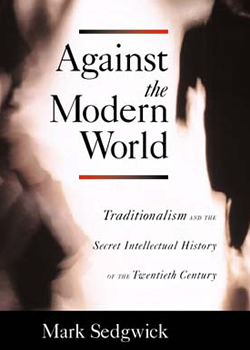 Among those who took Schmitt seriously was Leo Strauss, an important influence on many contemporary American Neo-Conservatives, including Paul Wolfowitz. page 97: although the Turkish authorities reported that "von Sebottendorff's body was found floating in the Bosporus" in 1945, this may not have been true. There is now evidence (which still needs to be checked) that von Sebottendorff remained alive after 1945, and was protected by Turkish intelligence (for whom he then worked) against anyone who might have been interested in him because of the role he had played in the origins of the Nazi Party. According to this version, von Sebottendorff moved back to Egypt, where he died in the 1950s. My thanks to Dr Thierry Zarcone for this. chapter 6: Guénon and Coomaraswamy were being read in Australia in the 1940s by two "classicist" Australian poets, James McAuley (1917-76) and Harold Stewart (1916-95). The two were responsible for Australia's most famous literary hoax, when in 1943-44 they composed parodies of the modernist verse they both detested, and had their parodies published in the leading avant-garde magazine, Angry Penguins, under the pseudonym "Ern Malley." Ironically, Ern Malley is probably more read today than either McAuley or Stewart. Further reading: Peter Kelly, Buddha in a Bookshop (forthcoming); Michael Ackland, Damaged Men: The Precarious Lives of James McAuley and Harold Stewart (Allen and Unwin 2001); Michael Heyward, The Ern Malley Affair (Faber & Faber, 2003). See also www.ernmalley.com. page 119: As an undergraduate student at Oxford in 1931, Martin Lings studied under C. S. Lewis, who at first thought very highly of his talents as a poet. By 1932, Lings had become a friend of the Lewis family. page 123: I. T. writes: "Black Elk Speaks was unsuccessful in 1932, what with the Depression and a lack of enthusiasm at Morrow, the publisher in New York, and was almost immediately remaindered. Its English language reprint was in 1959, so far as I can tell. Some . . . might even claim that Brown put Neihardt back on the cultural map." page 131: another independent order of importance in Italy is the Tijaniyya in Trieste run by Paolo Urizzi, editor of the journal Perennia Verba. page 161: as well as Maryami zawiyas in Europe, Argentina and America, zawiyas outside the Muslim world included one in Capetown, supervised by Martin Lings from the 1970s until Lings's death in 2005. See Martin Lings, A Return to the Spirit [Louisville, Fons Vitae: 2005] p. 78 n. 11.
chapter 8: the celebrated British composer Sir John Tavener is now arguably the leading interpreter of Traditionalism in the arts today. An Eastern Orthodox Christian, Tavener has described Frithjof Schuon as he "in whose mystical presence I live." Tavener's journey to Traditionalism was a long one. He first came to fame in 1968, when his The Whale was performed as the inaugural concert of the London Sinfonietta, and then released by the Beatles under their own "Apple" label. It featured "the then highly fashionable collage, pre-recorded tape, amplified percussion and a chorus using loudhailers." Tavener converted to Russian Orthodoxy in 1977, and for many years his musical work then followed Russian Orthodox themes and inspirations. Finally, at the end of the 1990s, he turned to Schuon and Traditionalism. chapter 8: Martin Lings died in 2005, aged 96.
pages 213-13: Kathleen Raine died in 2003. Nicholas Colloff, a friend of Raine's, has since explained to me that--despite her sympathy for Traditionalism--Raine was anxious to distinguish Temenos from a Traditionalist group. Her discovery of India (as both a spiritual archetype and an actual place) reinforced her view that the Traditionalist understanding was insufficiently "fluid, creative and life-enhancing." This view was eloquently articulated in the first draft of her India Seen Afar (New York: Braziller, 1991), though not in the published text. Raine saw modernity as dark, but she also saw it as a stage out of which a new light might emerge--a new creation rather than an "archaeology of tradition," as she once characterized Traditionalism. page 215: In a speech delivered at the Azhar in Cairo on March 21, 2006, Prince Charles returned to the subject of the unity of religions, referring to his 1993 speech, but speaking in even more Traditionalist terms: "It is Wisdom alone that can reveal to us those universal and eternal truths that lie at the heart of all the great traditions... This is not a phenomenon peculiar to the West. We see it in each strand of the Abrahamic faiths... Moderation comes from the Wisdom passed down to us through tradition." The somewhat unusual term "Abrahamic," which was not used in the 1993 speech, is popular among some Traditionalists. In his foreword to a memorial volume for Martin Lings, A Return to the Spirit (Louisville, Fons Vitae: 2005), Prince Charles wrote that he "used to look forward so much to what became an annual visit from Martin Lings," who he had met through the Temenos Academy (p. vii). page 216: According to a report in The Guardian, Prince Charles has been visiting the Greek Orthodox monastery on Mount Athos for periodic retreats. Prince Charles is rumored to have "embraced Orthodoxy." This is almost certainly going too far, but a growing sympathy for Orthodoxy is evident. chapter 12: Be'ad Artzeinu has been involved in more "actions" than the 2001 protest outside the Latvian embassy in Tel Aviv. It holds small rallies at which its members dress in red shirts, has been suspected of direct action against Arabs, and has performed a death curse against Hassan Nasrullah, the leader of Hamas. It describes its ideology as "Hyperzionism," a replacement for the now-obsolete Zionism that gave birth to the State of Israel. Hyperzionism aims not only to hold on to all the "occupied territories," but to extend Israeli control from the Nile to the Euphrates, by social and economic as well as purely military means. As a second step, Hyperzionism will then mark the twenty-first century for the world as a whole. chapter 13: Traditionalism is also indirectly influential in Bosnian public discourse. Traditionalists writings guided Rusmir Mahmutcehajic--later a leading Bosnian public intellectual and for a time a politician--from a youthful involvement with an underground group deriving from the Muslim Brothers to a Traditionalist understanding of Islam and other religions. Mahmutcehajic resigned from the government of Alija Izetbegovic when Izetbegovic accepted the de facto partition of Bosnia, and worked for the restored unity of Bosnia on the basis of what was ultimately a Traditionalist understanding of the unity of religions. Traditionalism is an important element in Mahmutcehajic's thought, but only one element in a wide-ranging and original analysis. chapter 13: Jordan should be added to the countries in the Islamic world where Traditionalism has had an impact. chapter 13: Traditionalism has reached the Tatars in Kazan . A collection published there by the "Iman Islamic Culture Center" includes translations of writings by Guénon, Burckhardt, and Schuon. chapter 14: Although Schuon's development of Perennialism "into a universal mission of his own... led ultimately to disaster " for himself and many closest to him, it did not end the stream of Traditionalism he had been so important in establishing. This remains alive and well. chapter 14: "A correspondent has drawn my attention to what might be a fundamental problem with my Against the Modern World..." [click here to read more]. Unless stated otherwise, these photographs are believed to be in the public domain or out of copyright. If the use of any photograph on this site is thought to infringe any copyright, please inform me immediately and I will either remove the photograph with apologies or, if permission is given, add an appropriate acknowledgment.